I’ve just returned home from four days in Houston at International Quilt Market and will be writing a series of blogs on this topic. 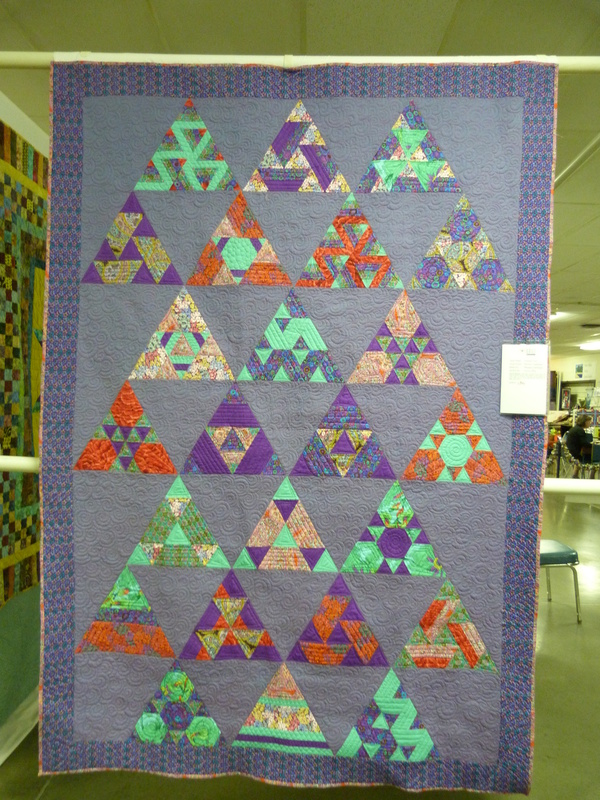 The scale of this event, which is a trade show at which quilt store owners purchase from manufacturers and distributors, is massive. 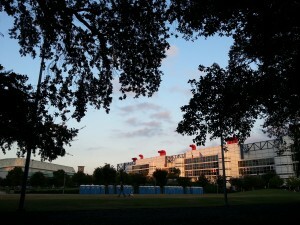 The George Brown Convention Center is a vast building, complete with a row of Porta Potties! Fortunately, the latter were for use by people attending events in the park in front of the Convention Center and not for us! 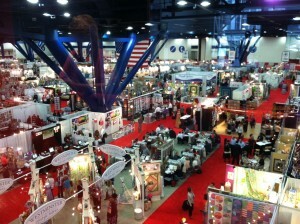 Upstairs in the Center there are round windows like port holes so you can look down on all the booths. 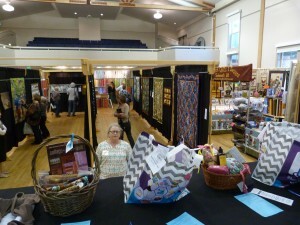 There were 24 aisles each with as many as 30 booths. 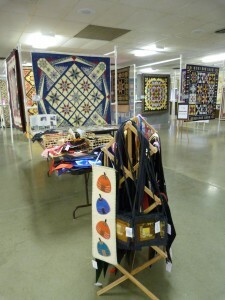 The day before Market opened, retailers and exhibitors could go to Schoolhouse presentations on new products and techniques. 12 to 15 sessions were running simultaneously. Most sessions were 30 minutes. 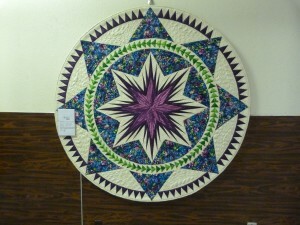 This went on for eight hours and it was hard to choose which ones to attend. 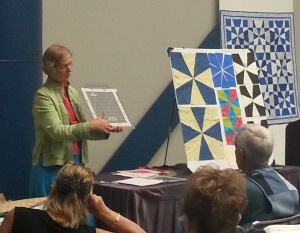 I was one of the presenters, sponsored by QuiltWoman.com, and introduced my template-free Kaleidoscope technique. 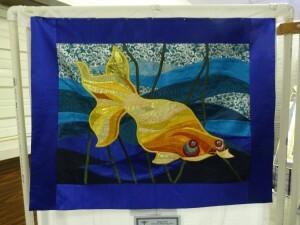 About 80 people came which was good considering the timing late in the afternoon, and it was well received. My good friend Nancy Watts came to Market with me and was my Vanna, holding up quilts for me during my talk. 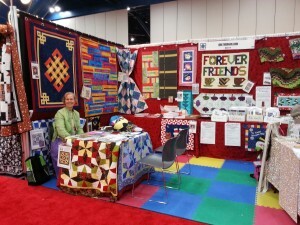 Nancy also helped us set up the QuiltWoman.com booth where I worked doing demos every morning of Market. 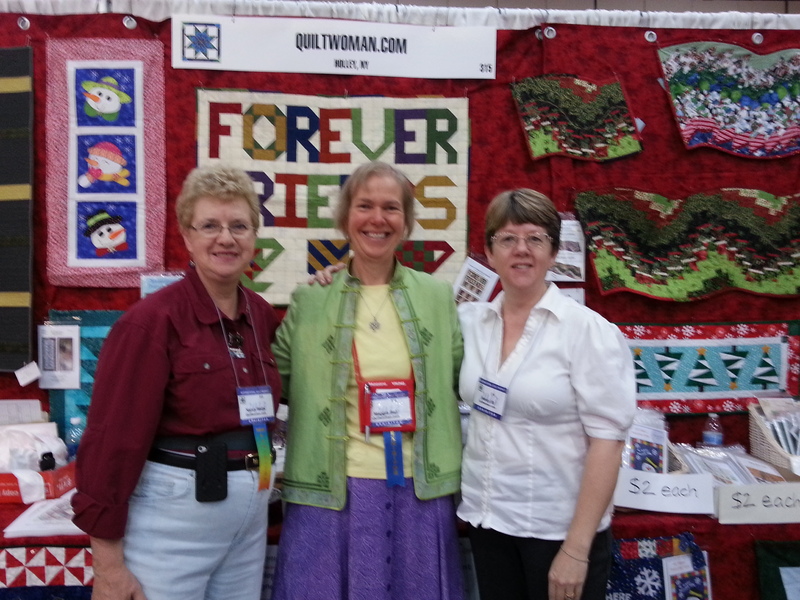 QuiltWoman.com is marketing my patterns and company owner Nancy Dill invited me to be there promoting them. 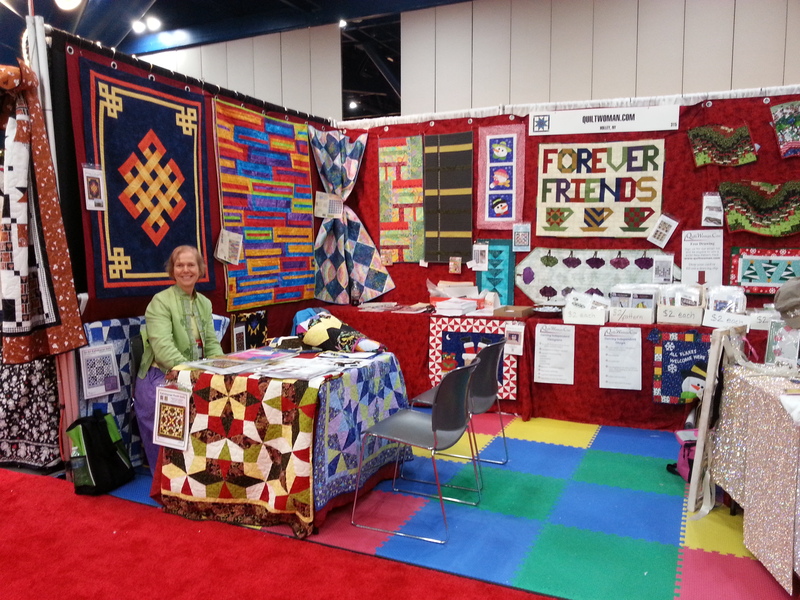 Nancy D and her friend Delores Joshua ran the booth and we had fun working there and relaxing with them for dinner each evening after the exhibits closed. 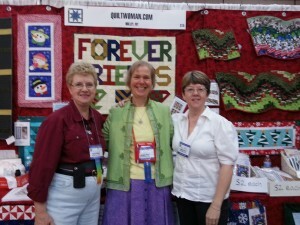 Here’s the booth with me at my demo station and a picture of me with the two Nancys. We were on sensory over for four days! 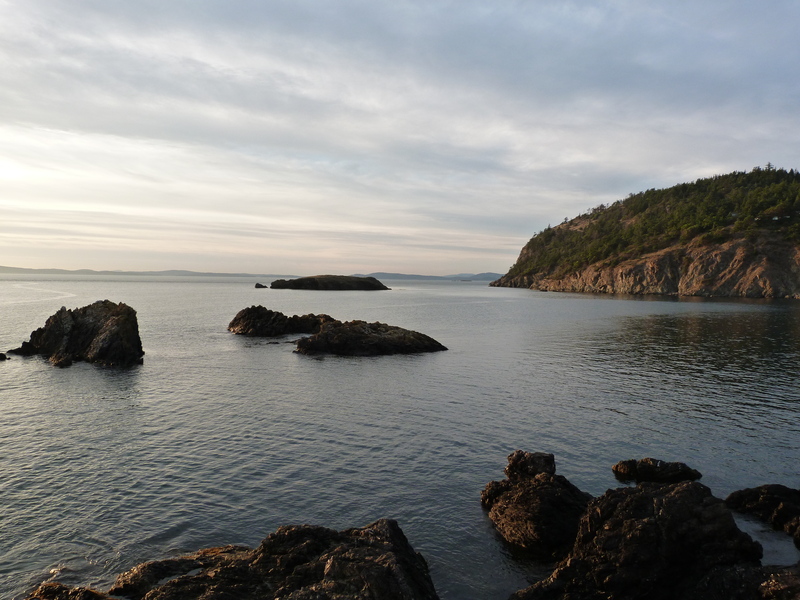 There was so much to see and it was extremely inspiring. 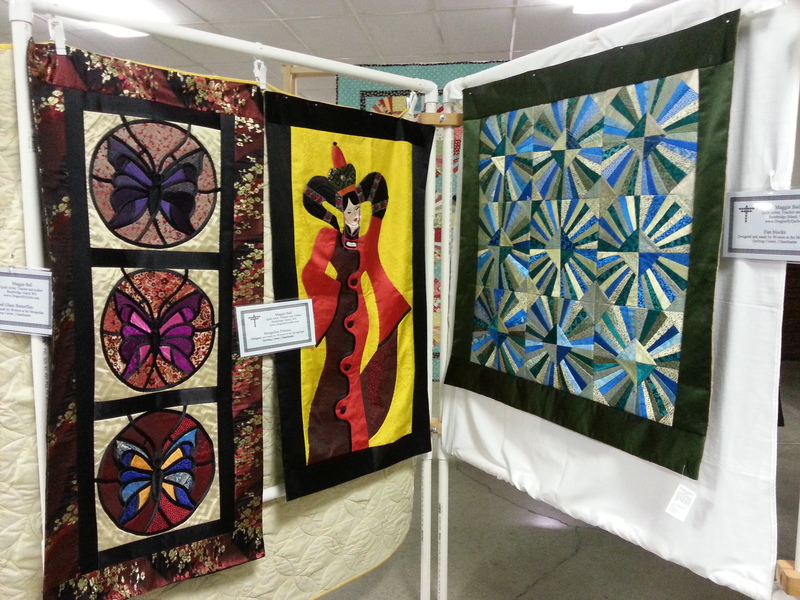 In addition to the 700+ booths, we also had access to the International Quilt Association judged show and numerous special exhibits with incredible quilts to be opened to the public at Quilt Festival following Market. 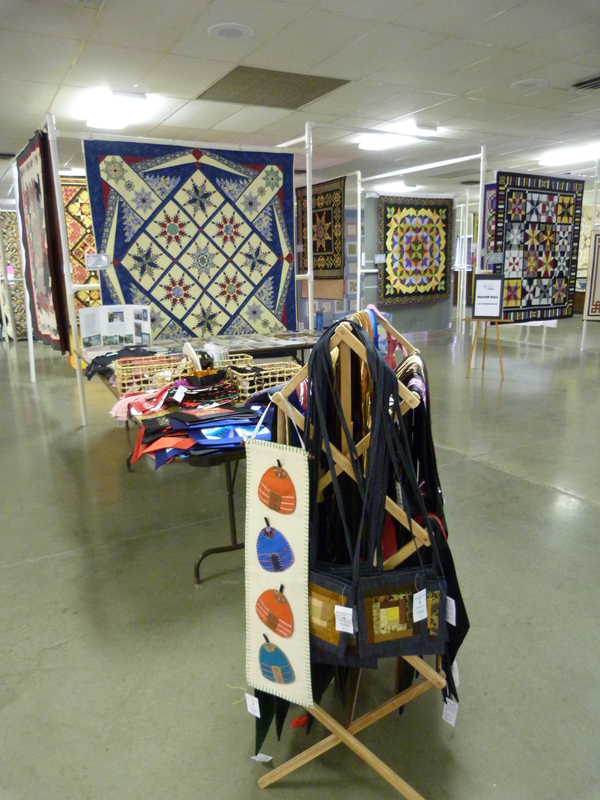 During Market everyone is so busy at the booths, that the quilt exhibits are wide open with no crowds. As exhibitors, we were able to go in early in the morning so grab some additional time there. I’ll post more on the booths, show and special exhibits in subsequent blogs. 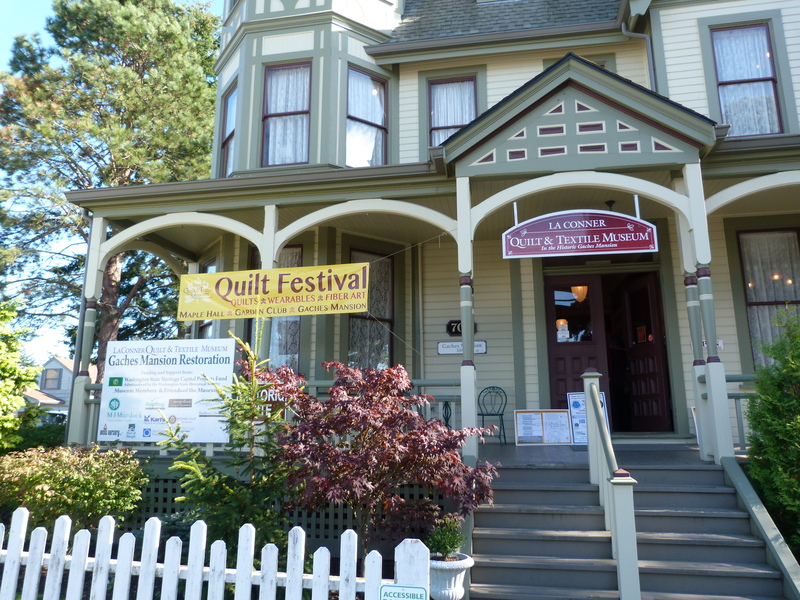 I was fortunate to recently attend the 2013 Quilt & Fiber Arts Festival sponsored by the La Conner Quilt & Textile Museum. The Museum hosted its usual exhibits and a couple of vendors. 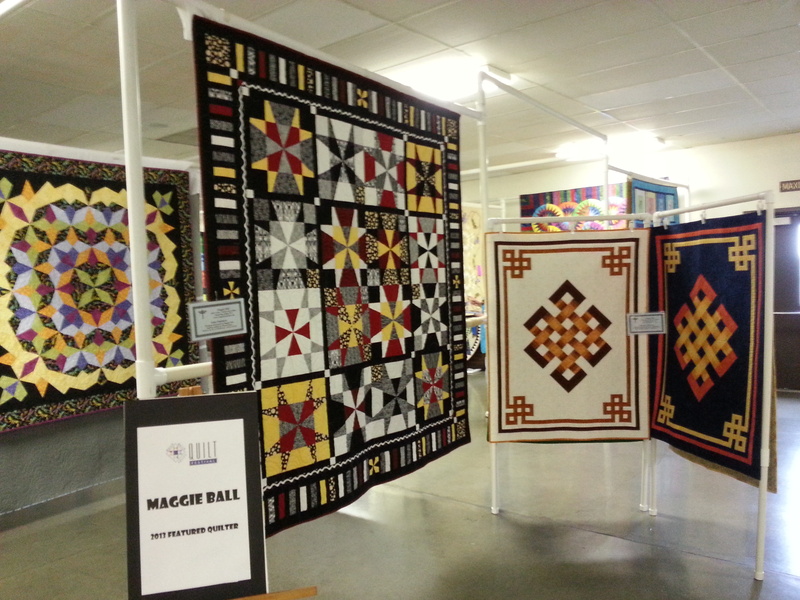 Most of the show was in Maple Hall where photography was not allowed, but I got permission to take a general view of the hall from the stage. 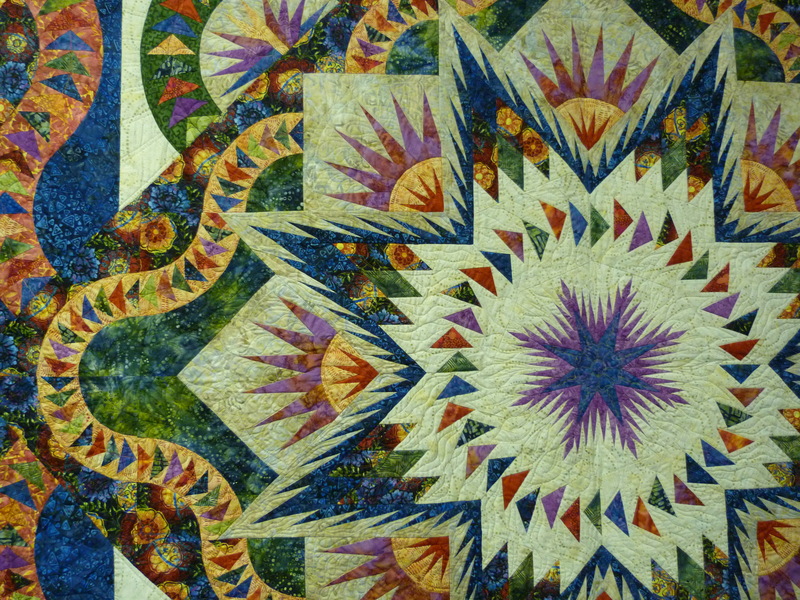 What really struck me about this wonderful show, was the variety of art quilts including some that were 3-D, and the breaking of the boundaries between quilting and other fiber arts. It was inspiring to see such an array of exhibits in this juried contest with entries from 17 states and 7 different countries. 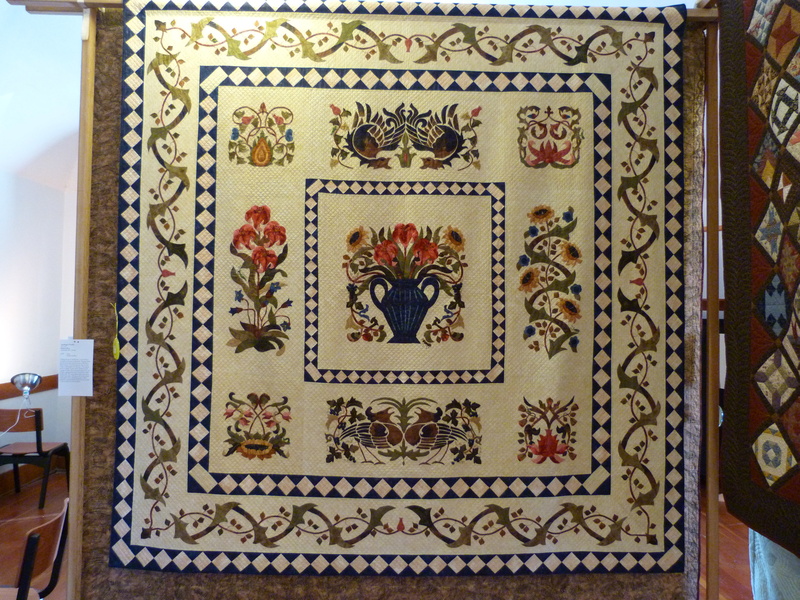 At the Civic Garden Club, just across the road from the Museum, were the quilts in the “Open Traditional Bed” category and the garments. 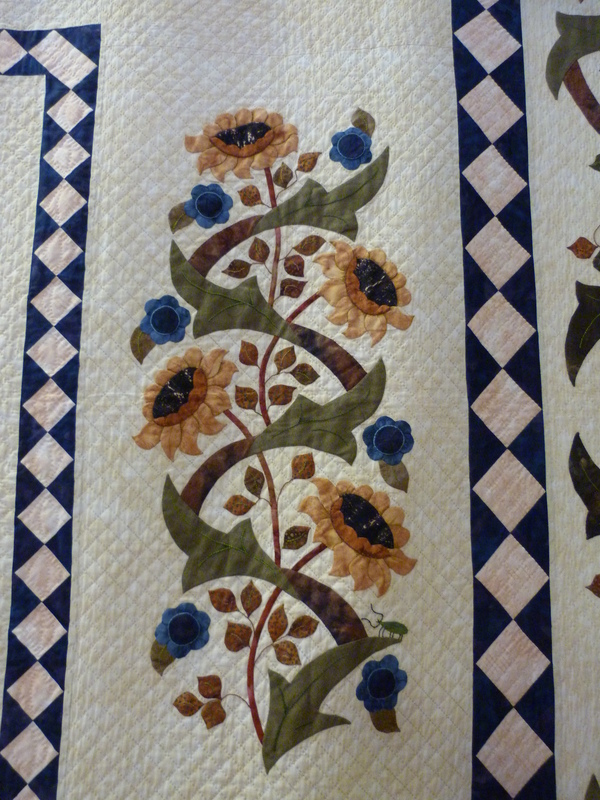 This was my first port of call and I enjoyed the exquisite beauty and workmanship of these quilts. 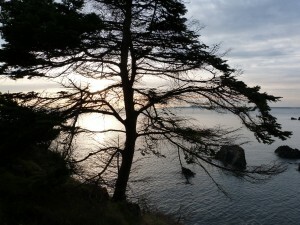 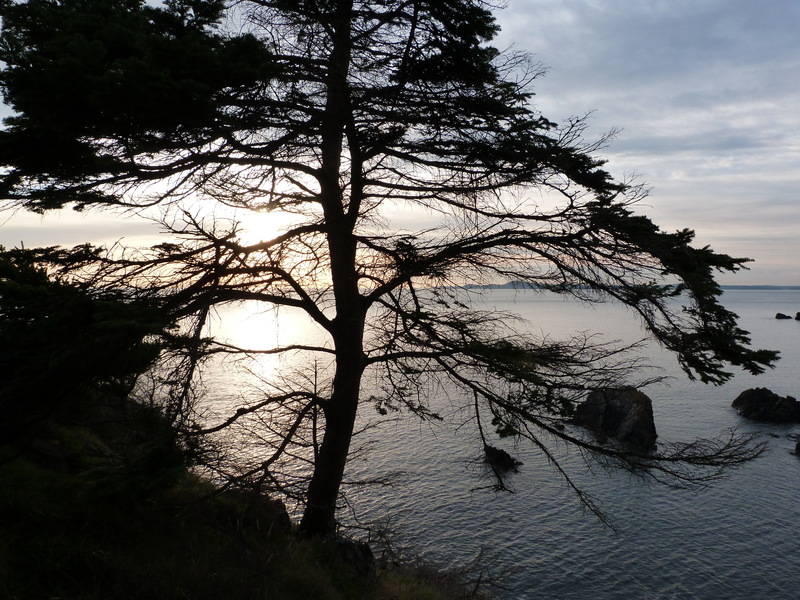 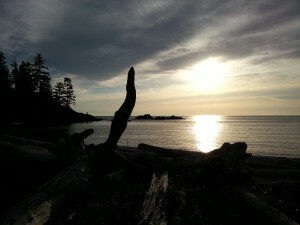 Here are three that particularly struck me. 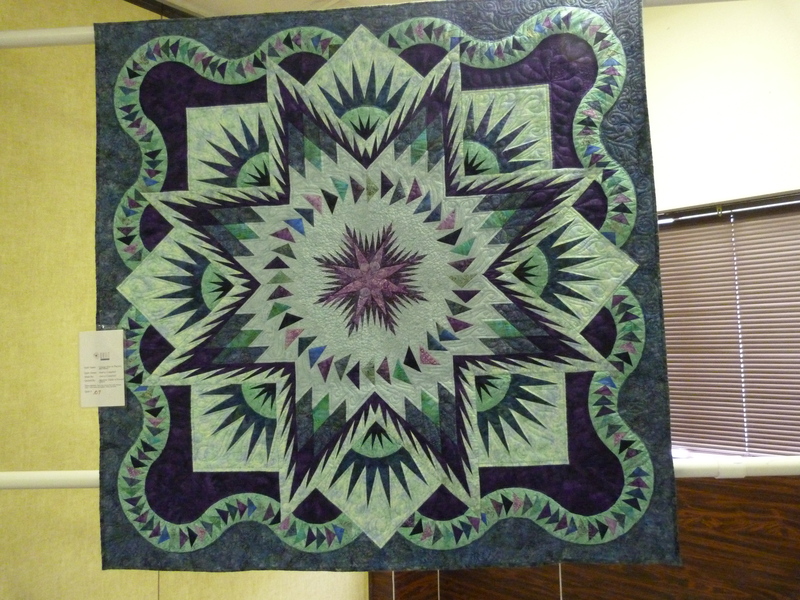 Pretty as a Peacock, 80″ x 80″, a first place winner, was made by Cindy Rainy of Kenai, AK who was inspired by the beautiful focal Oriental peacock fabric. 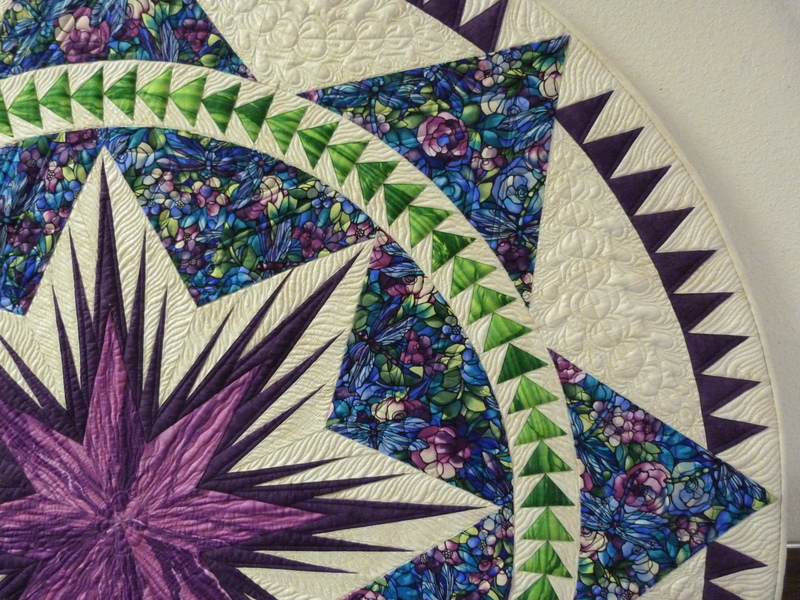 Her machine quilting is absolutely gorgeous. 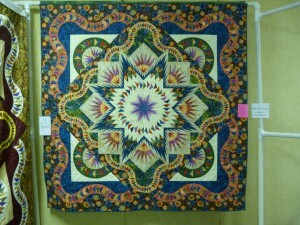 Cindy also made this lovely Double Wedding Ring quilt, 72″ x 80″, winning second place. 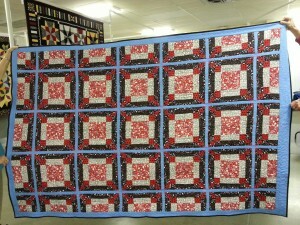 Again the machine quilting is fantastic and really complements the quilt. 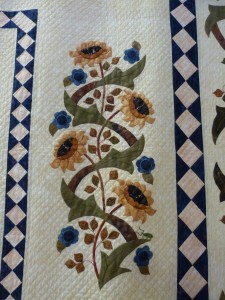 Cindy chose fabrics to give this traditional pattern more of a contemporary feel. 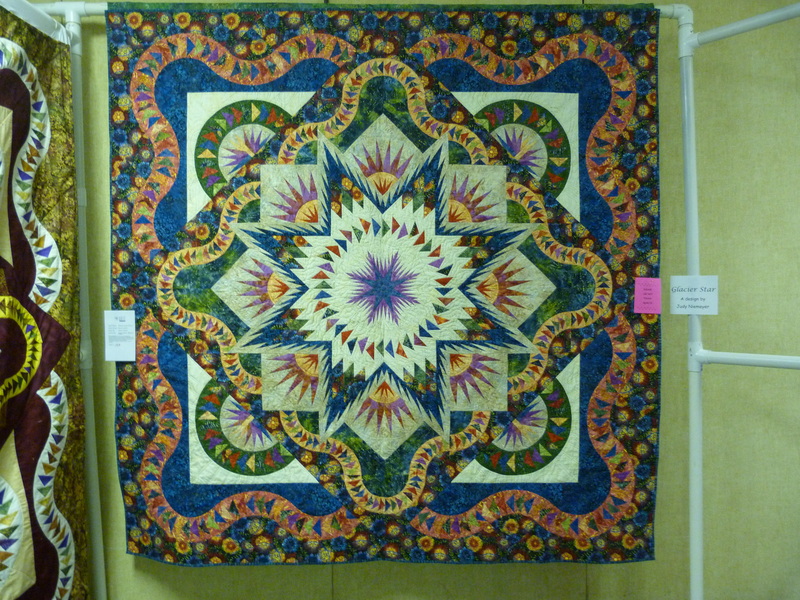 Barbara Root of Ladysmith, BC hand appliqued and hand quilted this spectacular quilt, Anything is Possible, 91″ x 91″. 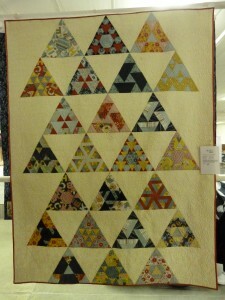 She saw a quilt, Expression of Morris, by Katie Friesa hanging in a quilt store in Manitoba and purchased the pattern. 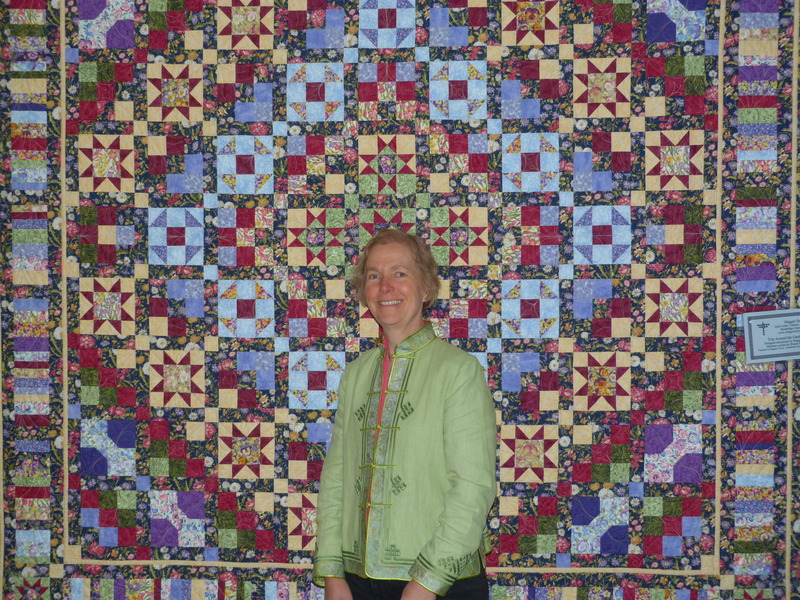 The pattern sat for a couple of years before she had the courage to begin the quilt. 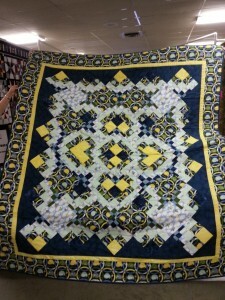 This is the first bed quilt she has hand quilted. 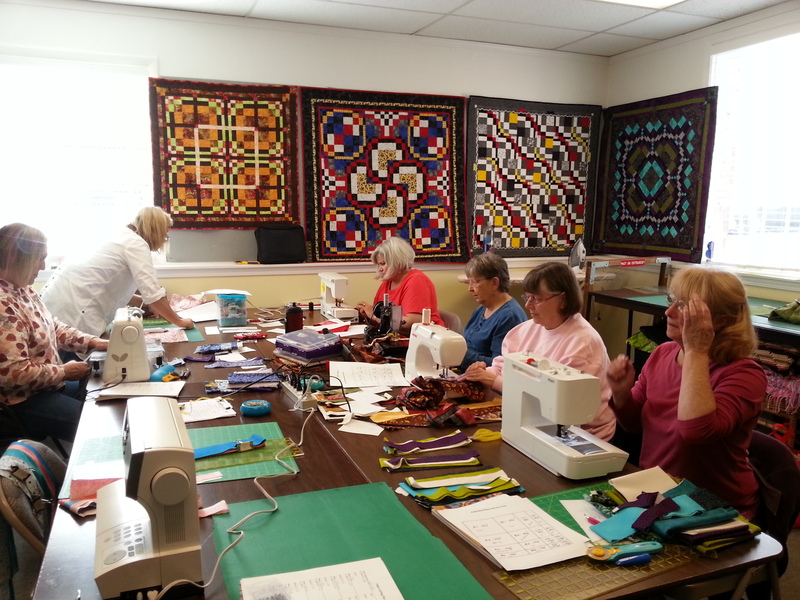 Two years ago I taught my Bargello Quilts with a Twist workshop and the Bear’s Paw sampler class for the Walla Walla Quilt Guild. 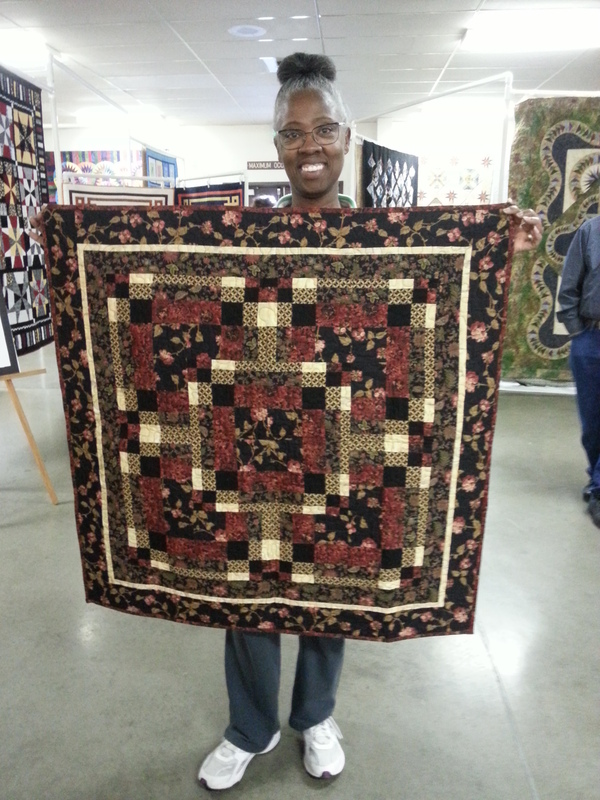 Aside from the thrill of being invited back to Walla Walla as the guest artist at their Quilt Festival, I was delighted when my former students brought their completed quilts to show me. Here is Brenda Jones with her attractive 16-block Bargello quilt. 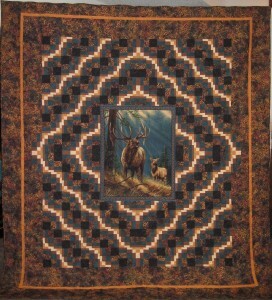 Jan Eaton made a large bed-sized quilt with an elk panel in the center. 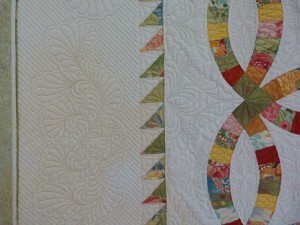 This is a gorgeous setting and the fabrics in the blocks really match the colors in the central panel. 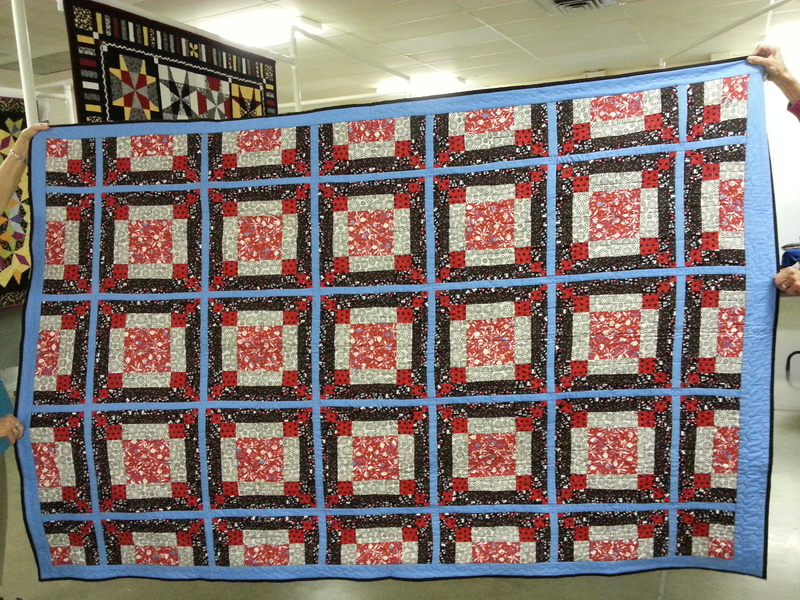 Betty Woods made two big bed quilts using the enlarged 9-1/2″ blocks. 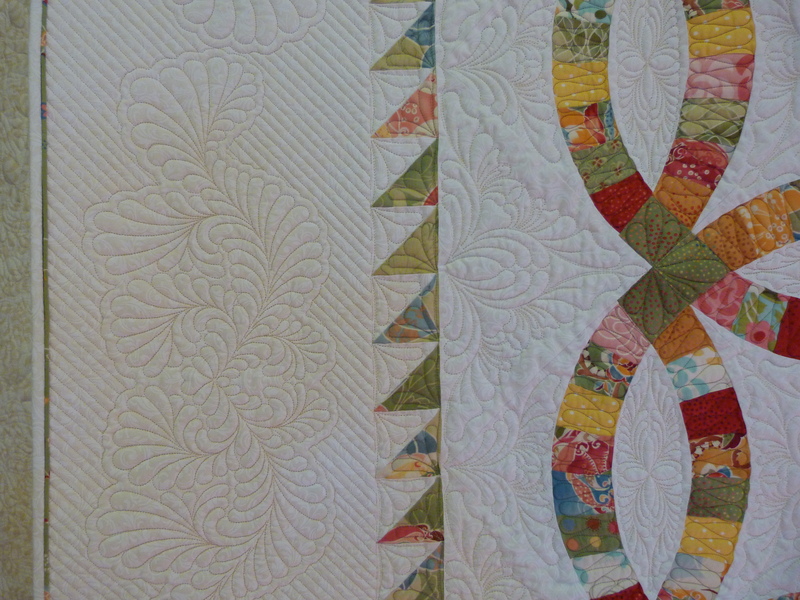 On the left is an on-point setting which includes large squares. The fabric is like a double wedding ring pattern with the a moon, sun, or earth in the middle of each circle. 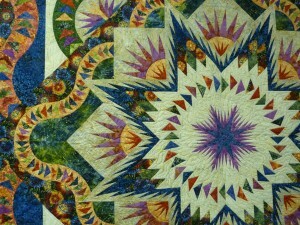 All the colors in the quilt are pulled from this fabric. 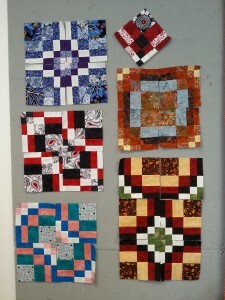 In the quilt on the right, the blue sashing sits in between clusters of four blocks in which the largest squares come together. 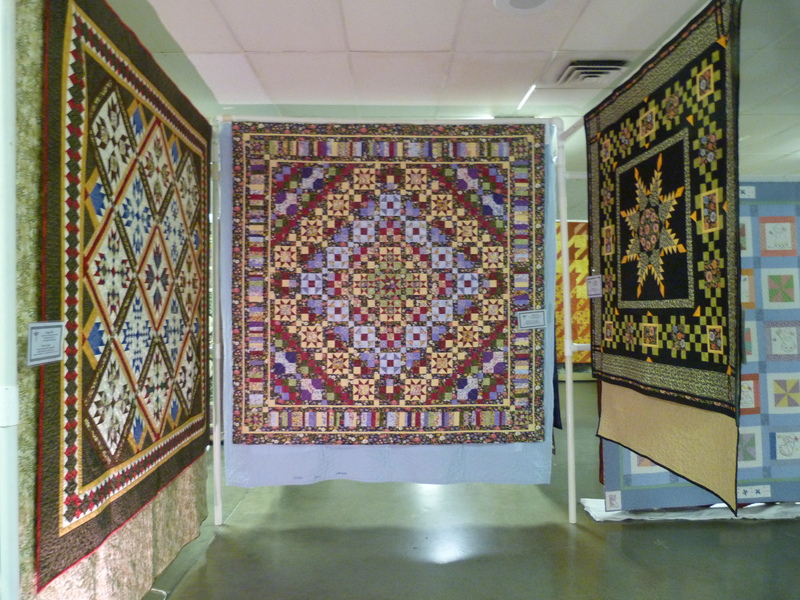 It’s hard to believe that these two quilts are made from the same Bargello block. 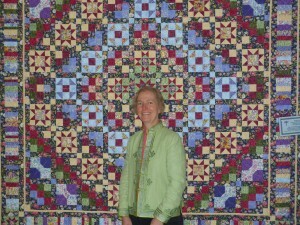 Pam Murray organized a barbecue at her house for all the show vendors, the local artist and me. 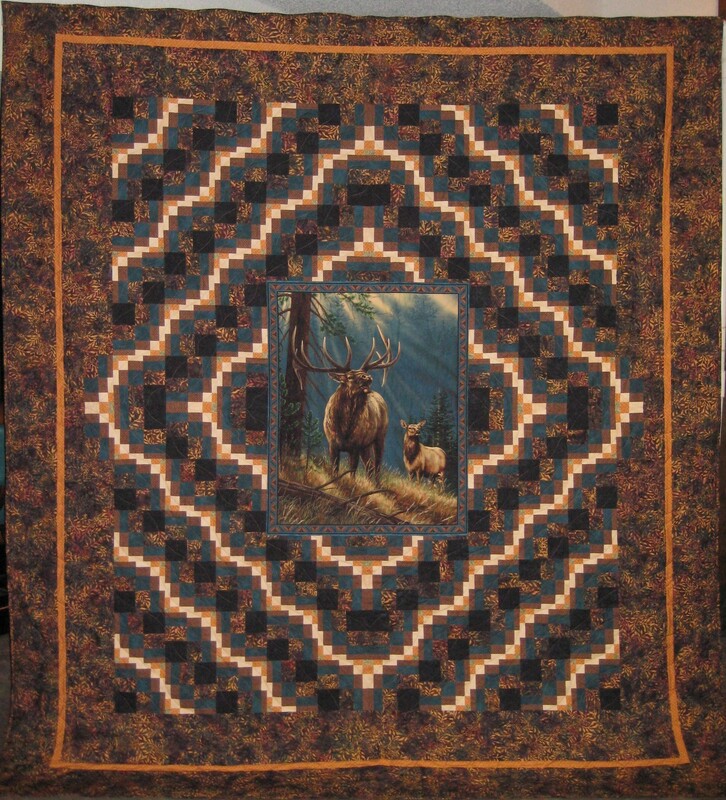 Draped over her couch was her beautiful Bear’s Paw sampler quilt made from five blocks with partial blocks in the setting triangles. 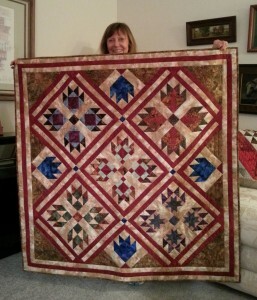 She graciously held it up for me to photograph. 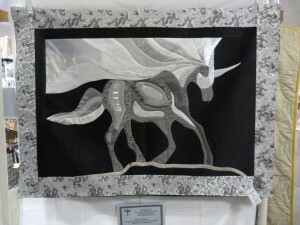 I love to see that my students complete their projects and are proud of their accomplishments. 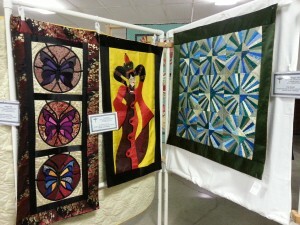 It’s such a joy to share in their enthusiasm. 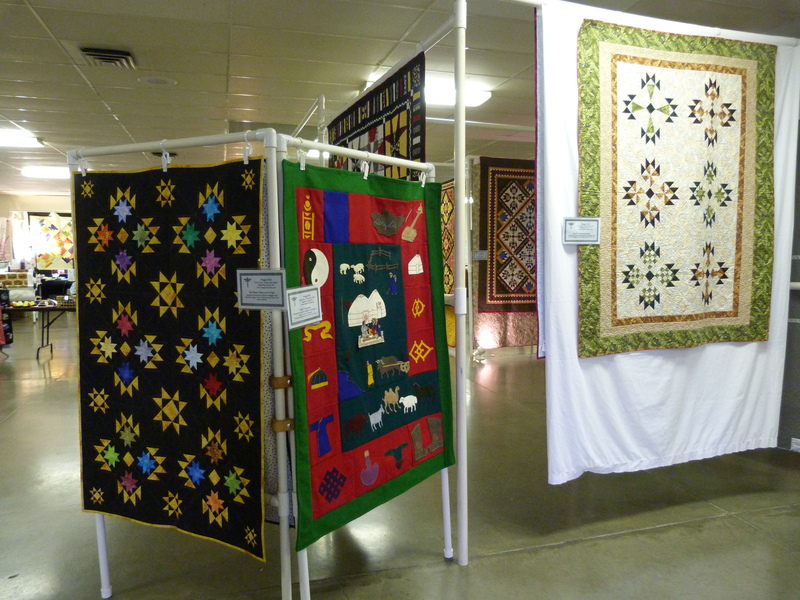 Each day of the Festival, I arrived a little early before opening to take a look at the quilt show beyond my exhibit area. 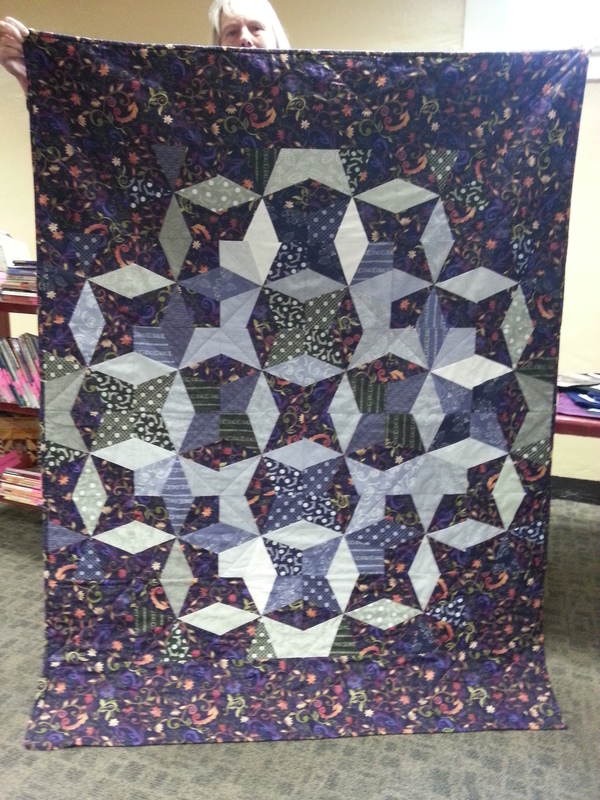 I was so busy during the show hours, that there was little time for this. 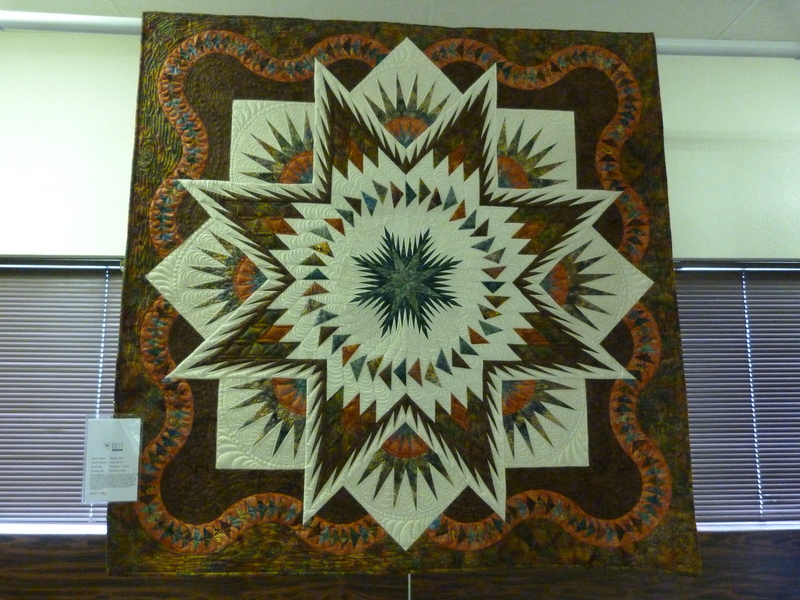 Star quilts always seem to grab my attention and there were several there that I found inspiring and admired. 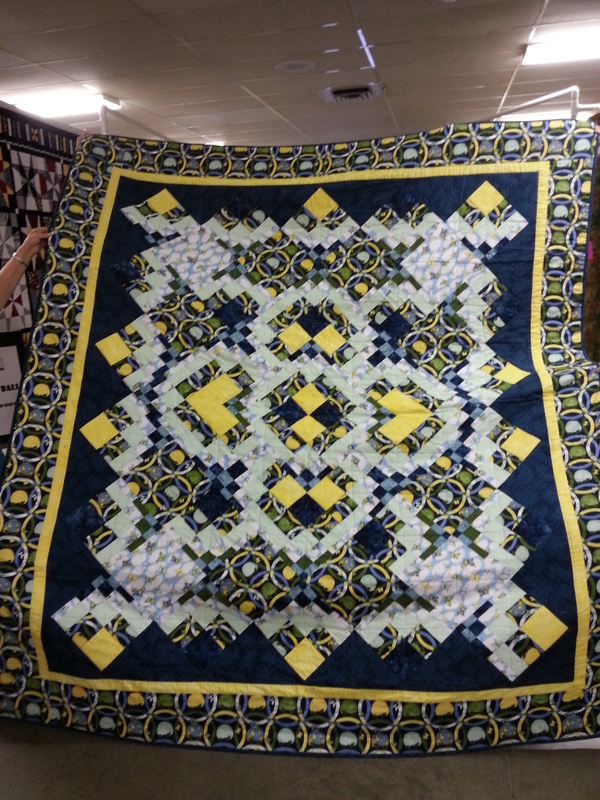 There were some Judy Niemeyer quilts resulting from classes sponsored by the quilt guild. 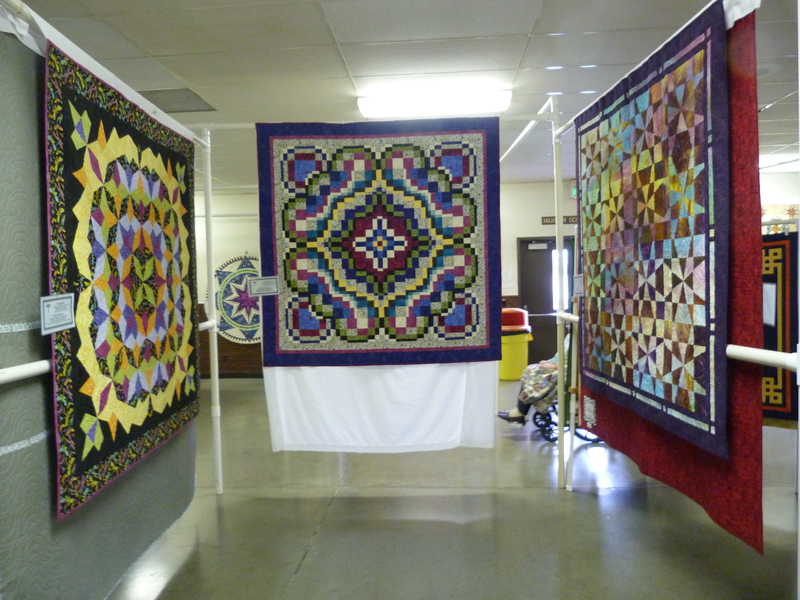 I thought the ones shown below, made by Audrey Campbell, Charlotte Collier and Rayni Lambert were particularly attractive with pleasing color combinations. 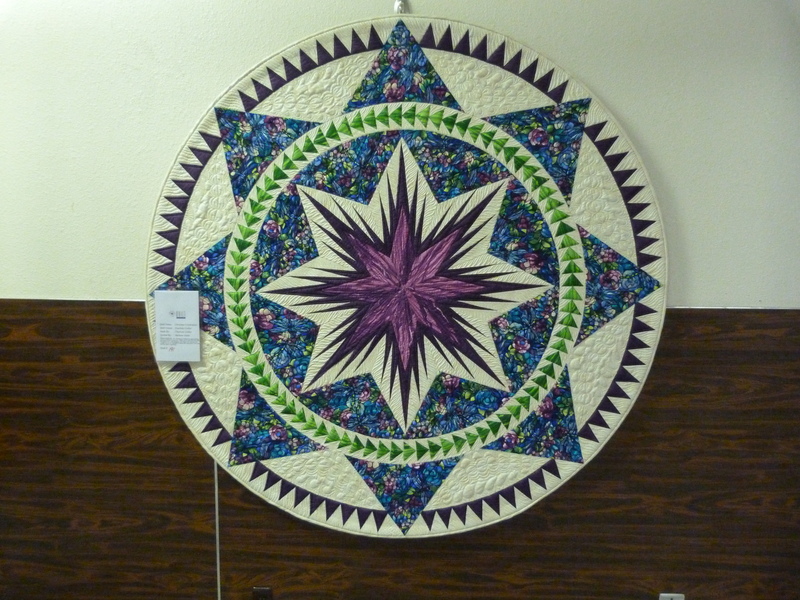 Charlotte Collier also made this spectacular circular quilt. She took a foundation paper piecing class for Christmas Celebration, a Christmas tree skirt. 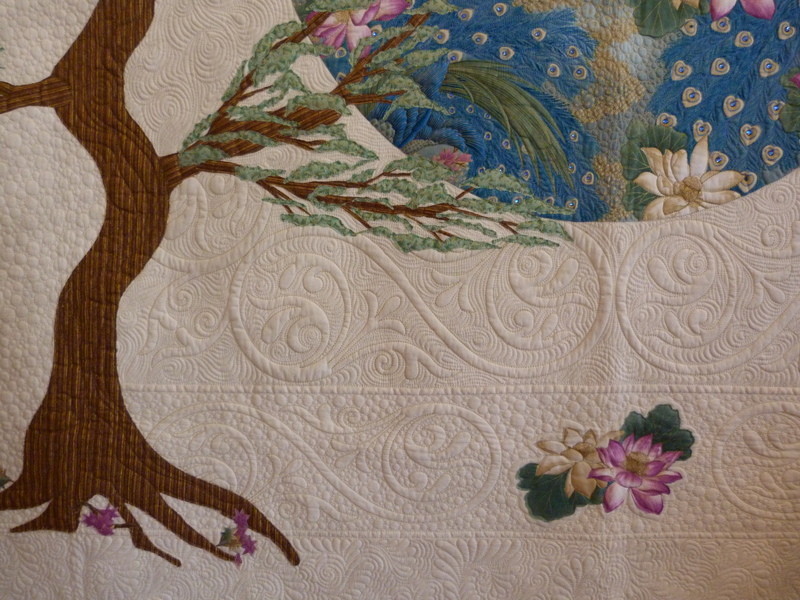 She liked the pattern, but didn’t need a tree skirt and wanted to use different colors. 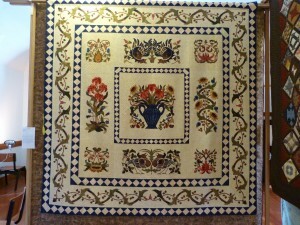 It makes a beautiful wall hanging kept rigid and circular by the insertion of tent poles around the circumference. 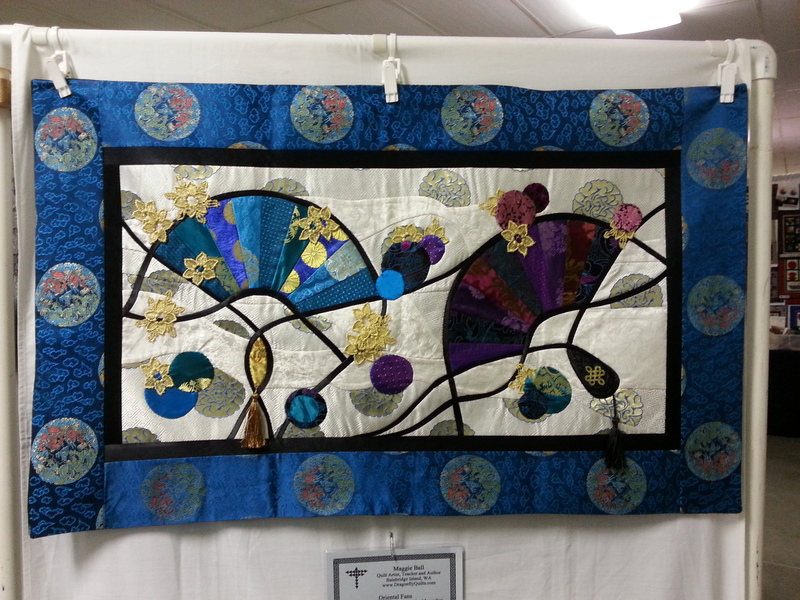 The machine quilting was by Marlene Oddie and really enhances the quilt. 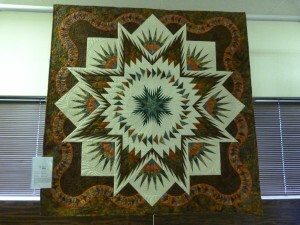 Here are a couple more star quilts that I liked. On the left, a lovely backdrop for the musicians who played during the show – Eddie Walker made this quilt to test a new pattern designed by Colleen Blackwood. 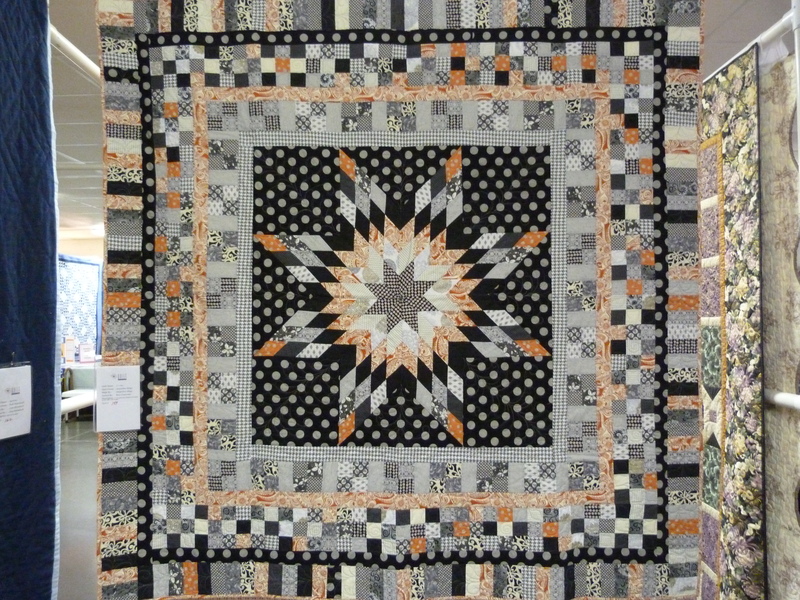 On the right, an attractive Lone Star medallion quilt with very nice black, grey, cream and orange coloration, Two + 2, designed and pieced by Jacqueline Mings, and machine quilted by Brie Clearwater. 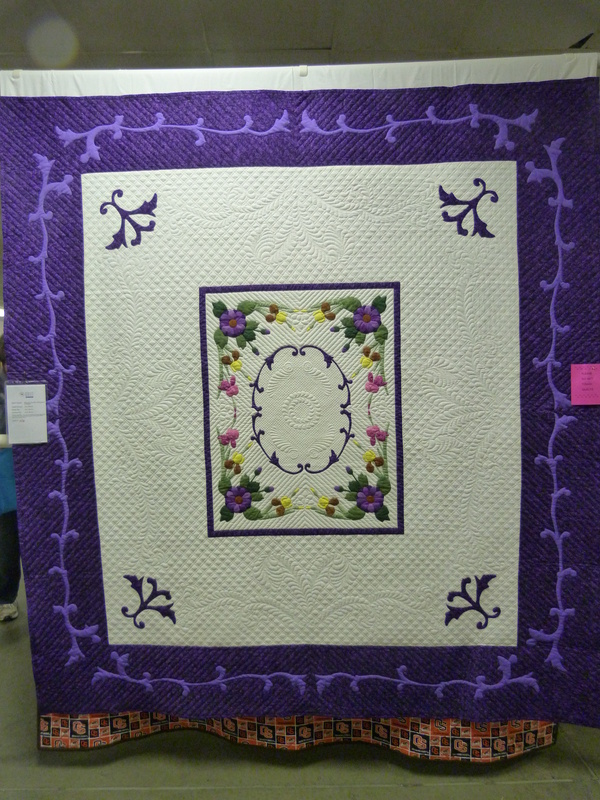 My picks would not be complete without Jess Berry’s beautiful hand appliqued and hand quilted quilt, Purple Scrolls, which he designed. 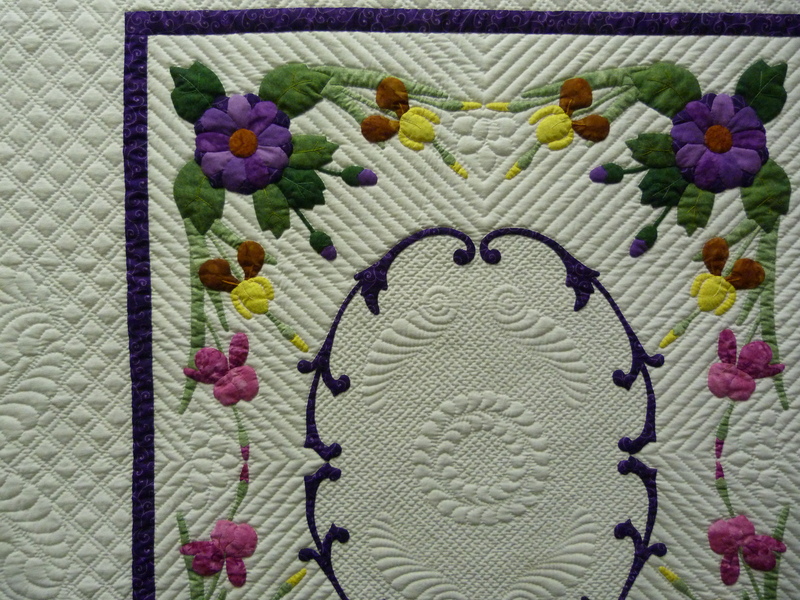 Jess has been quilting for over 30 years and typically spends three to four hours a day on his hand stitching. 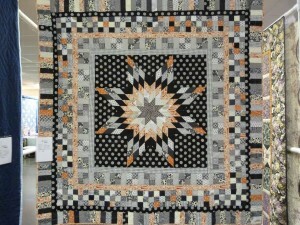 Another quilt he made was auctioned off as a Festival fundraiser. These triangle quilts were fun, and how different they look in the chosen color pallets. 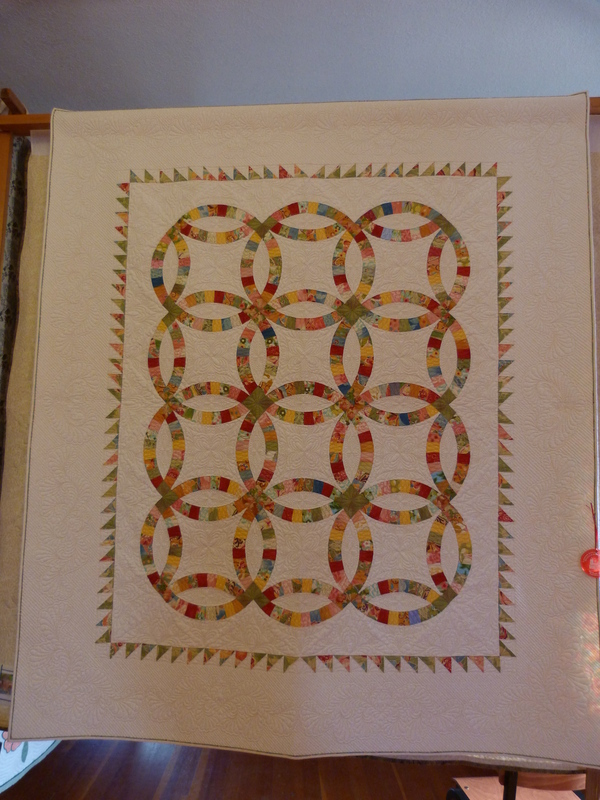 The design is by Julie Herman and employs the use of the Hex n’ More ruler by Jaybird Quilts. 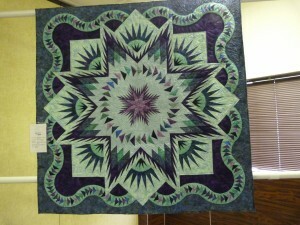 Rhonda Lineberger pieced the purple one, Painted Toes, and it was quilted by Teresa Silva. 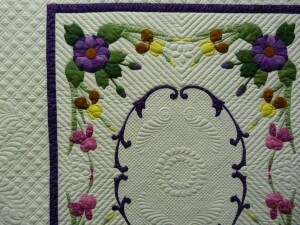 Teresa also made the cream one, Toes in the Sand. 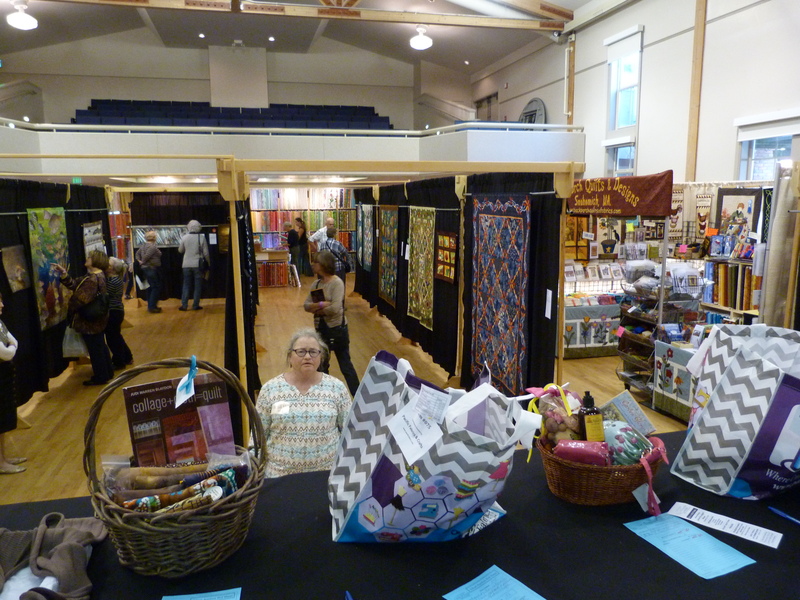 I was thrilled and honored to be invited to the Walla Walla Valley Quilt Festival as the guest artist at their 14th annual show. 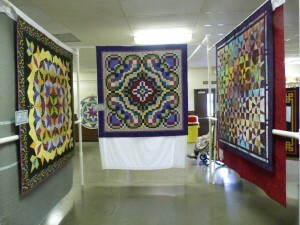 I arrived during set-up last Thursday with 11 large quilts and several smaller ones to hang. 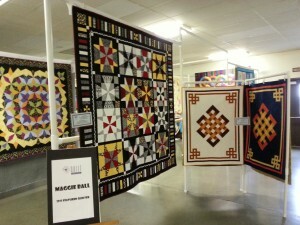 It was exciting to see all these quilts hanging in one place. 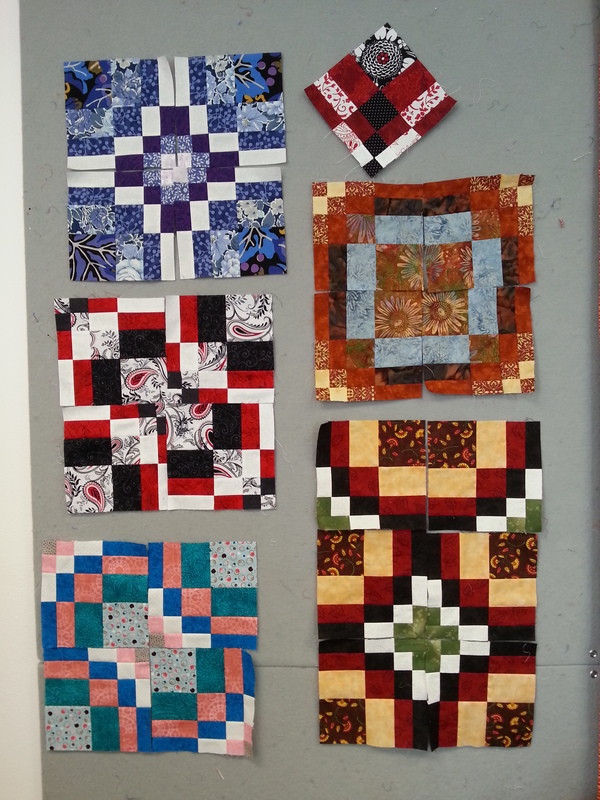 Usually they are held up during my lectures one at a time and I don’t see them altogether. 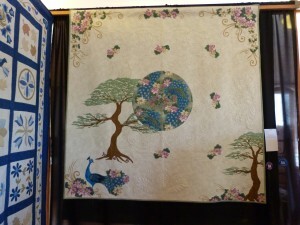 I was also provided with tables to display my items for sale – books, patterns and Mongolian items. 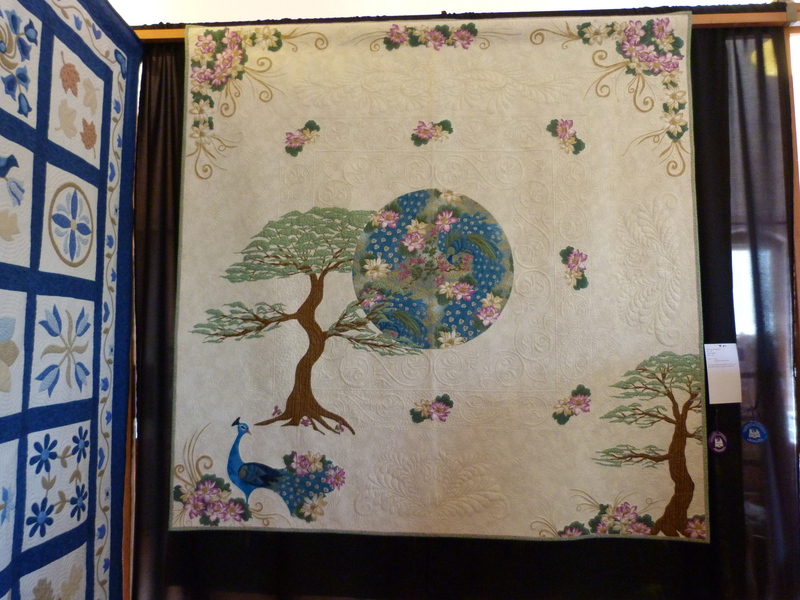 There was enough space to display several of the beautiful silk pieces made by Selenge Tserendash and women at the Mongolian Quilting Center. 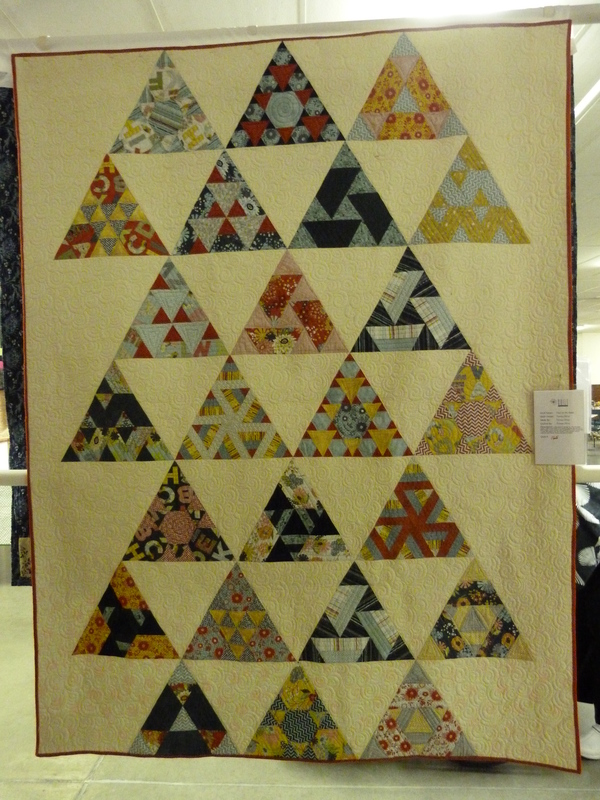 Show attendees loved these. 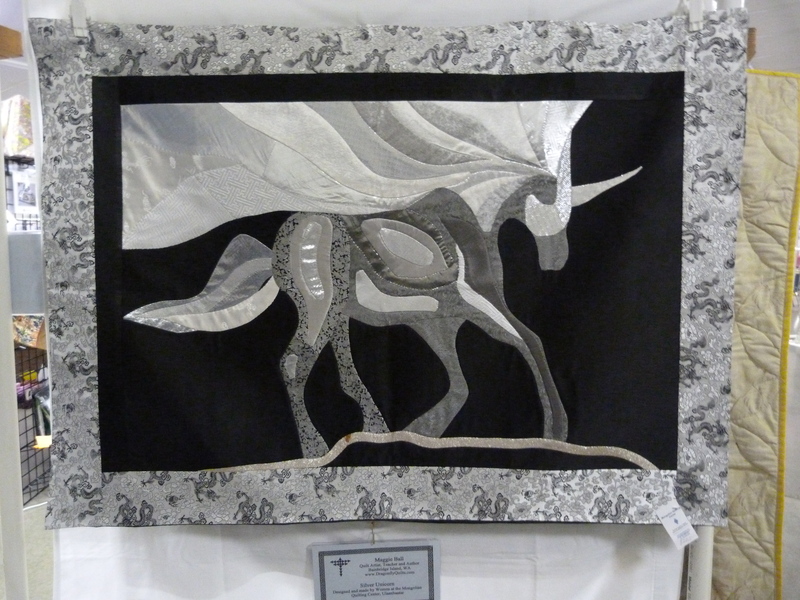 They were supportive in their purchases of Mongolian items at my table and we raised over $500 for the Center. 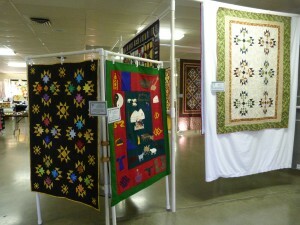 The show lasted for three days from Friday to Sunday. 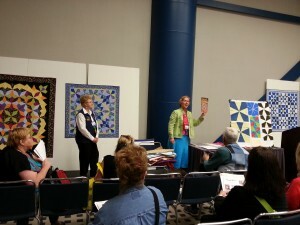 I was there the whole time and each afternoon did a demonstration in the demo area, sharing my template-free Kaleidoscope and Bargello block techniques. 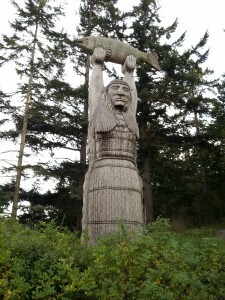 I had a warm welcome. The show organizers did an outstanding job and took very good care of me. 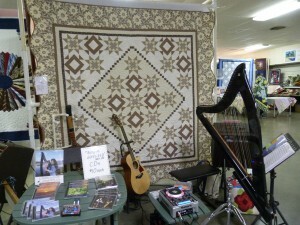 We had a potluck on Thursday for some of the Guild volunteers and on Friday evening there was a nice barbecue for all the vendors and featured artists (me and the local artist). It was fun meeting everyone and reconnecting with some of my students who I taught two years ago at the Walla Walla Quilt Guild. 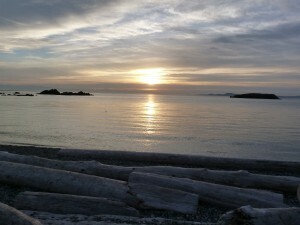 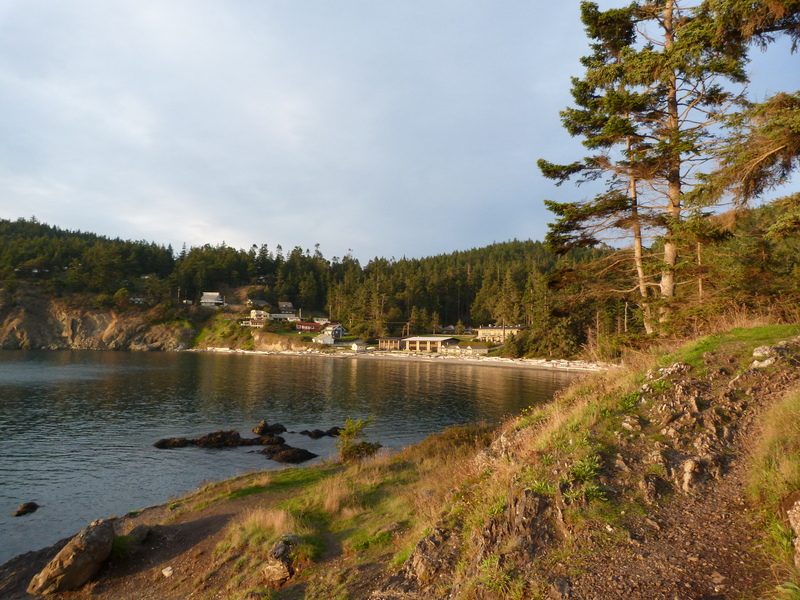 I stayed with an old friend on Saturday and Sunday nights then had a windy and wet drive home on Monday. 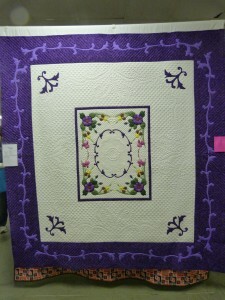 In my next blog, I will share some of my favorite quilts from the show.